Shipping & Returns policy - We ship same day before 2pm EST. 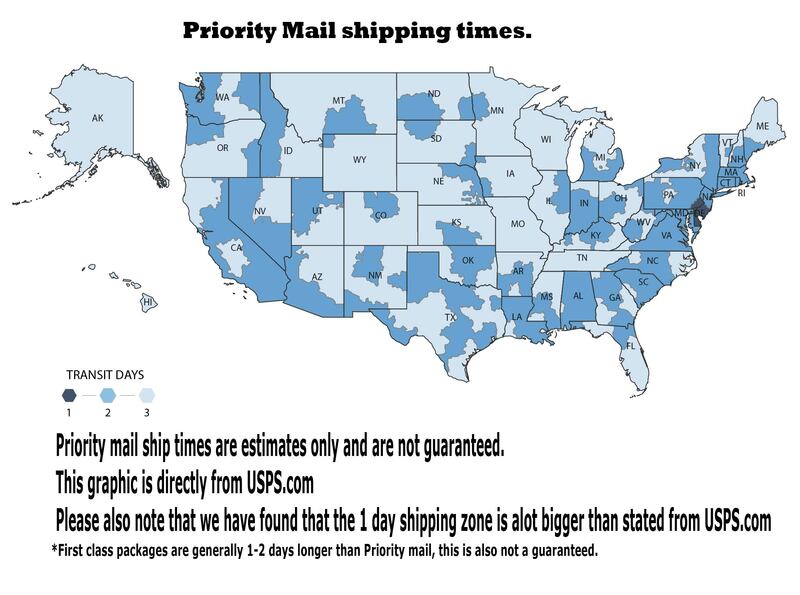 We now have UPS overnight and USPS priority Express shipping available. Orders placed before 2pm eastern time with UPS overnight shipping or Priority Express with ship out the same day. Orders after 2 pm eastern time wont ship out until the next day. Both USPS Priority Express and UPS overnight shipping are weight Based and are calculated in the shopping cart. Please plan accordingly when choosing UPS overnight or USPS overnight shipping. Our guarantee ship times may change due to inclement weather and disruptions in the postal service (USPS shutdowns). The safety of our employees is our first priority, we may shut down or open late due to weather and all delays will be posted on the front page website. Orders shipped to Canada are weight based and cost will vary based on the items you purchased. If you are not satisfied with any product for any reason it may be returned. You must email us at anteupgraphics@gmail.com within 10 days of receiving your product and get a Return Authorization Number. Orders may not be returned without this number. f. Describe the reason for returning the products. When we receive your returned order, the products will be inspected to ensure they were returned in resalable condition. Once approved, you will be issued a refund or a replacement product will be sent out to you. Please allow 1-3 business days for all returns to be processed once we receive them. Damaged Products: If you are returning a damaged product or a product that was sent to you in error, we will issue a full refund. Credit/Refunds: A credit/refund or replacement roll will not be issued until we have received the product back and tested the material. If new material is needed within that timeframe, please place a new order for the product. Return Shipping: Please be advised, if you are simply unsatisfied with your order, you are responsible for return shipping and will be refunded less original shipping costs. Make sure the package is insured, as we cannot be held responsible for damaged or non-deliverable packages. Example 1: If you purchase a product for $50 and paid $7.99 for shipping, your total came to $57.99. You will be refunded $50. Example 2: If you purchase a product for $100 and received free shipping, your total came to $100. We paid $10 to ship the products to you, you will be refunded $90. We have found it most efficient to not exchange products. It is best for you to return the products you don’t want and place a new order for the items you want.